Like many other churches in the early republic, the Congregational meetinghouse in Castine, Maine, served both sacred and secular functions. Built in 1790, it was home not just to worship services but town meetings and judicial proceedings. Taxpayers paid its pastor’s wages. Though the ratification of the First Amendment made such arrangements unconstitutional at the federal level, a year after the meetinghouse’s construction, at the local level church and state remained very much entwined for decades. When parishioners heard the tolling of the 692-pound bell Paul Revere cast for the meetinghouse steeple in 1802, they knew it might signal time to pray—or time to vote. 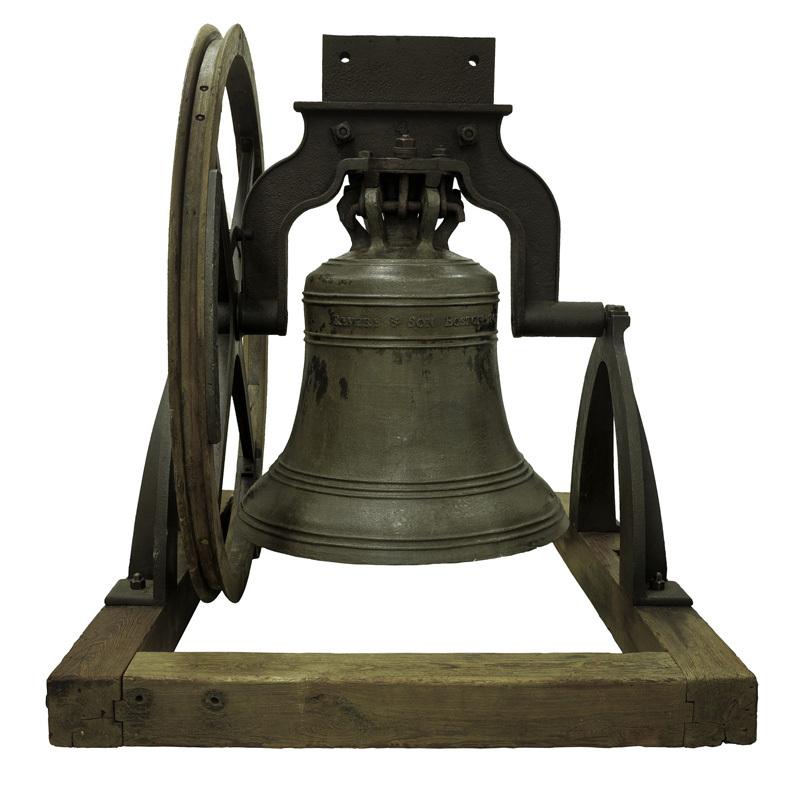 Currently on display in the museum’s "American Stories" exhibition, this bell was cast by Paul Revere. More than two centuries later, Americans tend to expect a much sharper divide between religion and all levels of government. And yet churches and other houses of worship continue to play an essential role in local, state, and national elections. Along with schools, libraries, rec centers, and other private and public institutions, thousands of churches (and a growing number of synagogues and mosques) serve as polling places across the country. In some areas, churches account for half of all available voting sites. Early on, electoral use of churches was a practical matter. In rural locales especially, churches were often the only buildings large enough to host community functions, acting when necessary as schools and hospitals as well as polling places. In towns and cities with more options available, voting might occur anywhere that could hold a crowd. As historian Rosemarie Zagarri has noted, in both the colonial era and the first decades of the republic “elections could be held at almost any public venue—from a town hall to a courthouse to a church or tavern.” No matter where voting occurred, it was often so disorderly—at times thanks to an air of celebration, at others due to the potential for violence—that every setting would be equally filled by the noise of democracy, even those that might be a peaceful sanctuary on any other day. Despite the pragmatic origins of the practice, voting in churches has become far more complicated over time. The expected political neutrality of polling sites has not prevented some churches from using their status as moral arbiters on Election Day. In the 1800s, churches with well-known stances on hot-button political issues, such as temperance and woman suffrage, hoped votes cast within their walls might be in keeping with the tenets of their faith. As recently as 1986, hundreds of Florida churches refused to serve as polling places to protest petition drives seeking to put pro-gambling initiatives on the ballot. 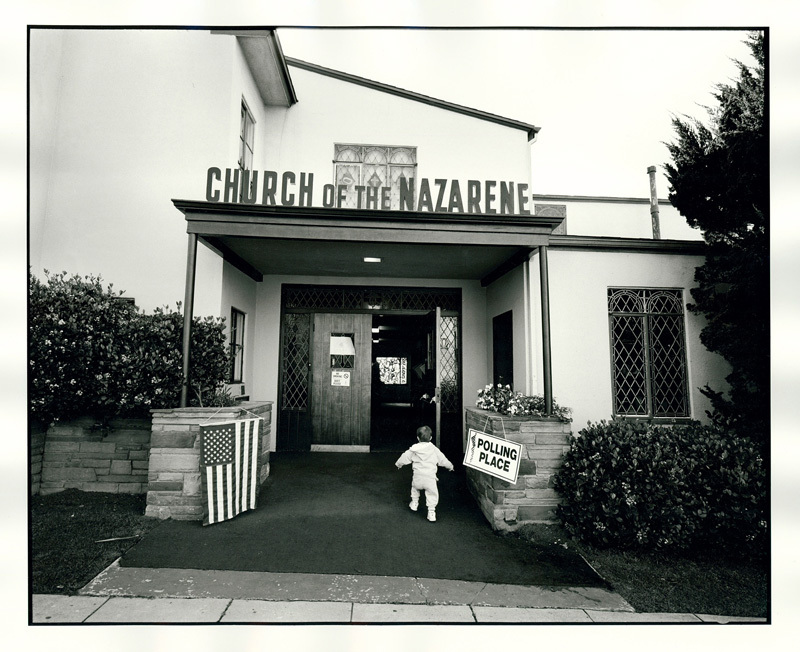 A Church of the Nazarene house of worship serves as a polling place in this 2000 photograph by David Hume Kennerly. ©David Hume Kennerly/Courtesy of Photographic History Collection, National Museum of American History. With questions of religious freedom and diversity becoming ever more politicized, in recent years the use of religious buildings for voting has been challenged in the courts and behind the scenes on election commissions. In 2007 a Florida lawsuit objecting to sectarian messages visible during voting in a Catholic Church was dismissed by a federal judge who maintained that voting in churches was constitutional. Elsewhere in Florida a few years later, a mosque was removed from a list of county polling places after local election officials received complaints and threats of violence if the practice continued. Whether driven by First Amendment concerns or prejudice against minority religious groups, objections to voting in houses of worship often raise an issue highlighted by recent scholarship. Over the past decade, several studies have shown that where one votes matters. Though every state has laws prohibiting the display of campaign materials at voting locations (usually stating that political signs cannot be displayed within 100 feet of a polling place entrance), it is possible that polling places themselves subtly affect the choices of those who step behind the voting curtain. Religious sites, these studies suggest, exert a small but measurable influence on votes cast. Yet at a time when non-voters far outnumber members of either political party, having as few barriers as possible to voting, and making abundant venues available, can only be a benefit. Whatever future generations might decide about the church-state implications of voting in houses of worship, the practice has been a vital part of American history since before the first ringing of Paul Revere’s bell. Do you know where you would go to vote in the next election? Find your nearest polling place here. Peter Manseau is the Lilly Endowment Curator of American Religious History at the National Museum of American History.